Train with the Revoflex Extreme just 5 minutes a day and you will achieve tremendous results! Abdominal muscles, back muscles, arm muscles, shoulder muscles, thigh muscles, and glutes are trained at once! Different muscles are trained at once with this unique sports equipment! The Revoflex Extreme takes advantage of bidirectional power. The rubber bands set up an increased resistance while pushing forward and thus achieve a more intense workout.When sliding back the built-up tension is released slowly. This returns you easily to your starting position. You can choose between 6 different training levels and 44 different exercises and thus optimally tailor your workout to your body. Now with the Revoflex Xtreme, you can lose your weight by using it simply for five minutes on a daily basis and you will reach tremendous results. Abdominal muscles, back muscles, arm muscles, shoulder muscles, thigh muscles and gluteus area unit can be trained at once with it. 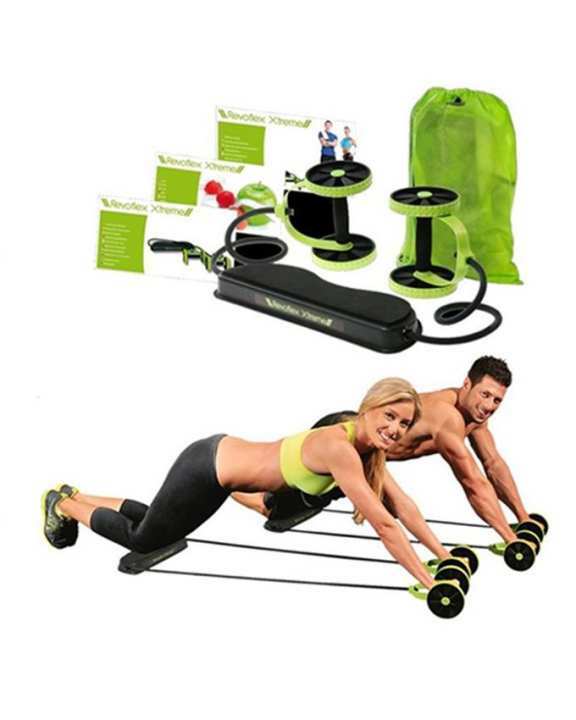 It is an intense and easy abdominal training which defines upper, middle, lower and oblique abs and develops your chest, back, arms, shoulders, and abs in one movement lightweight and easy abdominal training. please check the description and please check any you tube videos madam.